Two small does come down a trail which winds between a row of houses and Interstate 95. One deer becomes nervous and runs off, but the other stays. There is 90 minutes before legal sunset and the deer is unaware of my presence. 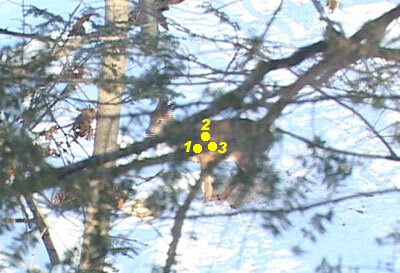 Please note, the camera angle is down by my ankle due to the position of the treestand in heavy cover. I have a clear shot so disregard the limbs in the way and - answer this question based on the photo angle as shown.